Abu Dhabi demands that the international coalition against ISIS arm local Sunni tribes in Iraq to fight the jihadists. The United Arab Emirates, which suspended air strikes against the Islamic State (ISIS) terror group, wants the US-led coalition to arm Sunni tribes in Iraq to fight the jihadists, government media reported Friday. participating in strikes against Daesh" - an Arabic acronym for ISIS. An even greater concern, according to the paper, is the lack of support for Sunni tribes in Iraq's Anbar province, large parts of which have been overrun by the jihadists. 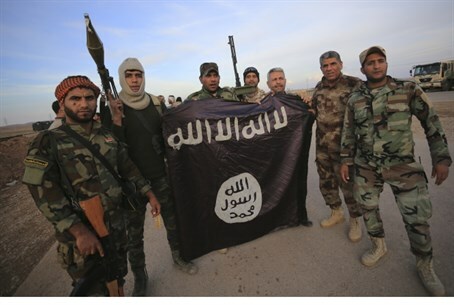 train and equip them in the war against Daesh," it said. "Neither air strikes nor a media war are sufficient to defeat" ISIS, the paper added. The UAE pulled out of air strike missions in December, shortly after a Jordanian pilot was captured by ISIS extremists after his F-16 fighter jet went down in eastern Syria, according to US officials. Airman Maaz al-Kassasbeh was later burned alive by the jihadists in a gruesome video released this week. The Pentagon said Thursday it was redeploying some aircraft from Kuwait to northern Iraq to boost its ability to rescue downed coalition pilots, as requested by the UAE. ISIS spearheaded a major offensive in June that overran large areas north and west of Baghdad, including significant parts of Anbar. Sunni tribal fighters have played a key role in keeping the jihadists from gaining further ground in the province.